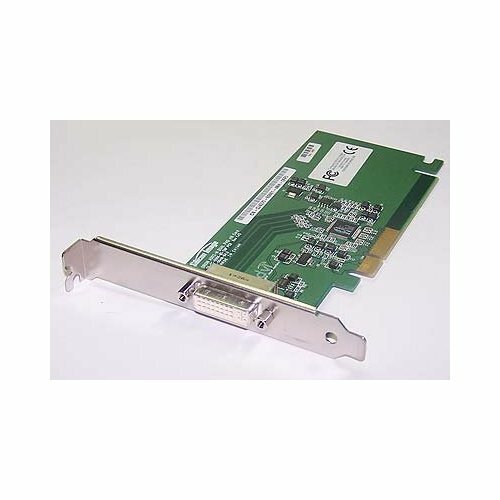 The DVI ADD2 is an Advanced Digital Display 2 (ADD2) adapter card that offers a convenient, low-cost method for connecting a DVI digital display to the graphics controller of an i915G/945G-based mainstream or high-end desktop PC with a vacant PCIE x16 slot. The adapter card is based on the Silicon Image Sil 1364 Transmission Minimized Differential Signaling (TMDS) transmitter, offering high quality visual experience with a rock solid, crystal-clear display. Many computers nowadays come with integrated graphics. This can be a blessing for people looking for a smaller or simpler system, be it as a back-up, a work PC, or a home theater setup. Despite how we like to bash IGP setups when we're talking about PCs, they have a million and one uses. Of course, some of them have one of the biggest hitches in the industry at the moment - no DVI. As screen real-estate has expanded, monitors just don't use VGA much anymore. The industry has moved on from it, and none too soon - resolutions are getting too big for small-pin configurations to handle with a good picture. It gets worse when you want dual monitors - there are no available IGP solutions that support dual DVI outputs. Plug it in to an available PCIe 16x slot, and enjoy up to 1600x1200 resolution on a single-link DVI output. Got two slots? Plug in another for up to three monitors. The card is low profile and is nothing more than an extension of the IGP, so it requires no cooling (but provides no upgrades in speed, mind you!). It is currently certified to work on Intel 915 and 945 chipsets, as well as ATI's RC410.